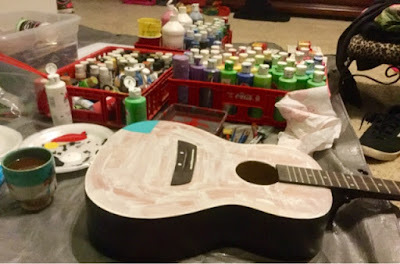 I had a request from my son to paint him a guitar. You see, he had “Sharpied” me a guitar last October. Click HERE for Rob’s guitar designed with Sharpies. I have a son and a daughter. 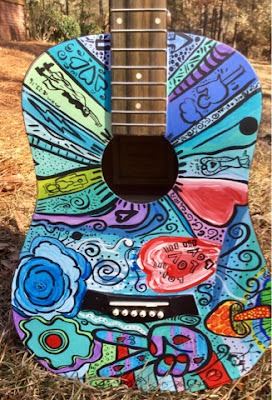 Of course, my daughter got wind of this request and became interested in a hand painted guitar of her own. Check out the results below. I purchased kid guitars. Each guitar cost about $75 each. Rob had requested a small guitar that he could just “grab and go”. 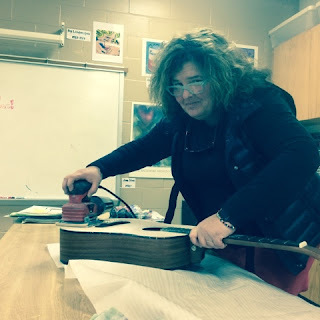 I sanded the guitars in my classroom. My art teacher friend, Laura Harrison, was about ready to kill me. There was lots of noise. Also, there was a cloud of dust floating in our building for a few days. During Christmas break, I feel certain that the dust settled. Ha Ha. 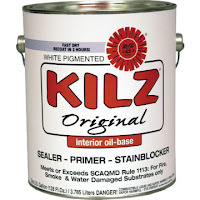 Once I got the guitars sanded, I put a coat of Kilz primer on each guitar. 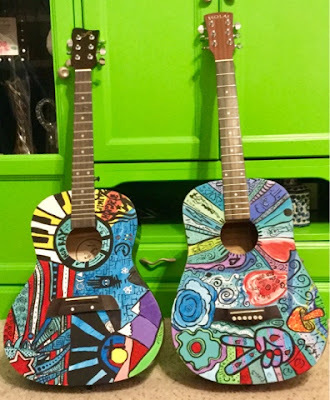 Then, I began painting the guitars. On some designs, I would draw with pencil. I freestyled most of both guitars. I had to hide in the bedroom to get finished with the guitars. My kids were both home from college and I wanted to keep my guitar presents a surprise. 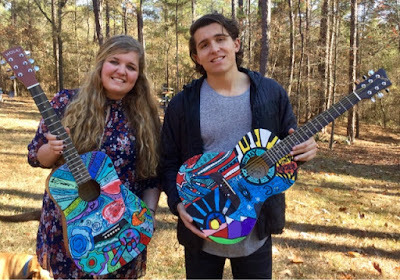 Have a look at the finished guitars! 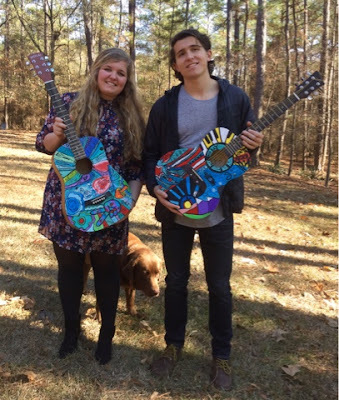 Callie’s guitar is below. I gave nods to Howard Finster, Pearl Jam,The Who, Woodstock, music, angels, doctors, The Allman Brothers, peace, and love. Rob’s guitar was a bit of a challenge. 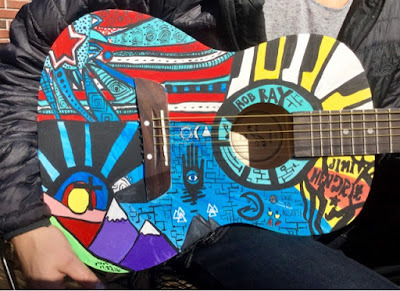 I could not just put random designs on his guitar. I thought that the guitar would look a little too “girly”. I included Picasso, Jimi Hendrix, America, Young the Giant, Peter Max, the Atlanta Hawks, and Jesus, in his design. 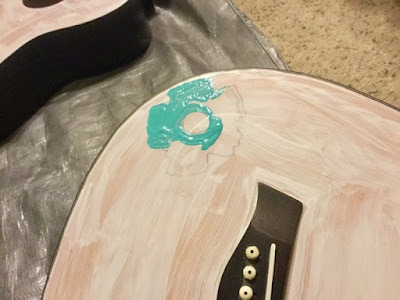 I debated on whether or not to put polyurethane on the guitars for protection. I decided no on the polyurethane. I did not want to take a chance on the yellowing effect that polyurethane sometimes causes. 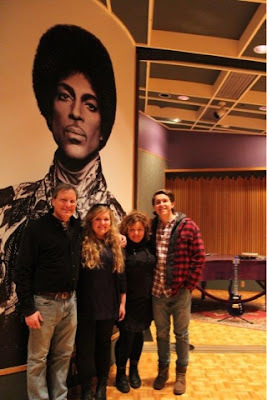 Funny thing, we went to Minneapolis last week and toured Prince’s Paisley Park. Paisley Park was pretty cool for the Prince fan! Guess who had the coolest guitars? Prince! Unfortunately, we could not take pictures on the tour at Paisley Park. With the purchase of Prince’s purple flash drive, McKenzie (our awesome tour guide) used the Paisley Park camera and took a picture of us in front of Prince’s Purple Piano and Guitar. 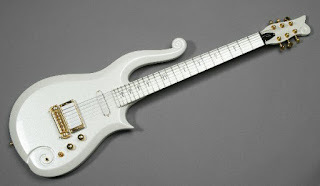 Prince could really play the guitar. Check out this video below with Prince, Tom Petty, Steve Winwood, and Jeff Lynne. Prince has a pretty amazing guitar solo in the video. As I toured the Paisley Park, Prince’s guitars sat in silence because their artist is gone. No more strums with Prince’s fingers. Prince’s screaming guitars and Prince’s screaming fans stopped making noise on April 21, 2016.